For 1,800 people a day streaming out ISIS-held territory in Iraq, passing through a military checkpoint is no guarantee of safety. 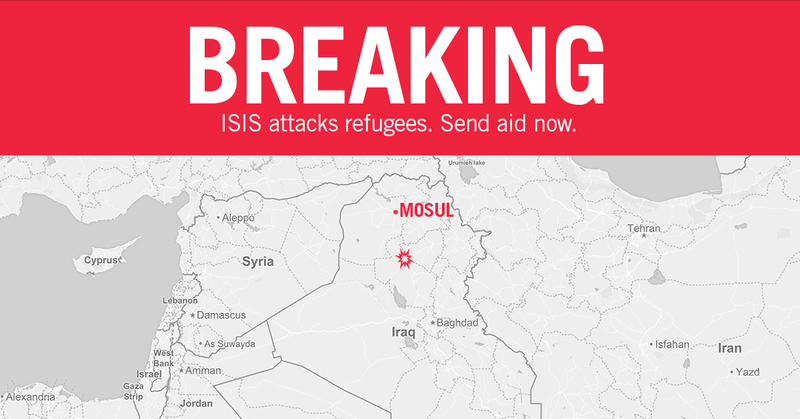 Earlier today, ISIS launched a rocket attack on a refugee center near Tikrit, about 90 miles north of Baghdad—and the world barely noticed. At least 13 people were killed when six mortars struck their camp. Dozens more were injured, some critically. We were there—as survivors were rushed to a local hospital, as doctors scrambled to treat the wounded. We were there as they ran out of supplies, as the situation threatened to overwhelm the hospital’s already limited resources. Doctors on the front lines asking us to rush medical kits to the scene immediately. We’re already on the ground, serving families in this camp—many of whom fled from Mosul, the last major ISIS stronghold in Iraq. Just last week we delivered enough food to feed 1,000 families for a month. Now they need us to show up again. Please help us save those who were injured in this cowardly attack. $45 can provide 3 medical kits for injured refugees.